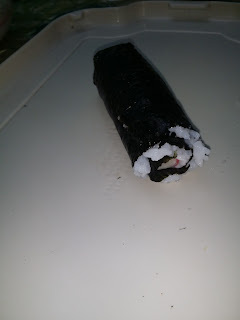 Wasn't my first time making sushi. Monday used to be sushi day for my husband (zaman sebelum Sofia). Had been quite some time since I last made one, but I got inspired to make one again after reading Nany Fadhly's blog post. Thank you Nany Fadhly for sharing! You can read more on how to make your own sushi, Nany Fadhly style, here. Her sushi had more stuff in it. Mine was very simple. Although I got inspired make one similar to hers, the end result was really, just like one I used to make before. Hahahah. So, if you're planning to make one, or it is your first time making it, try mine. Heheh. 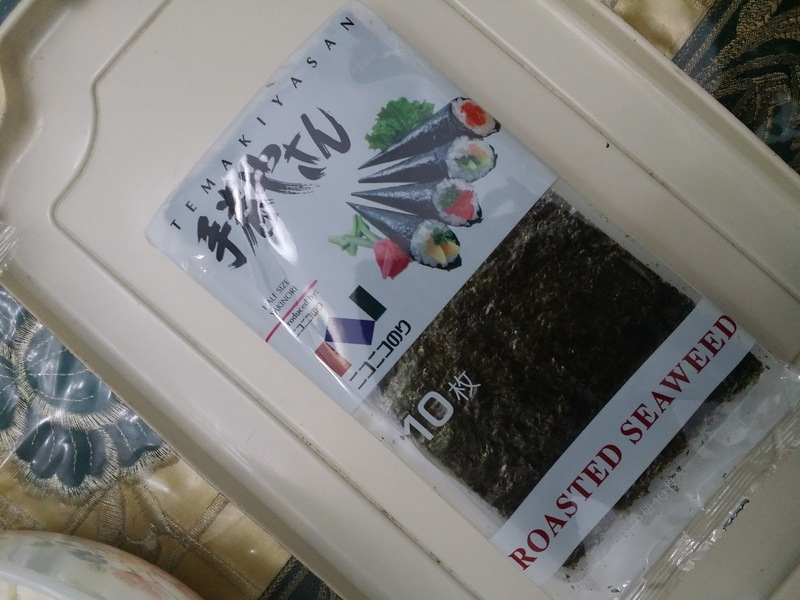 Basically, you will need seaweed. There's a bigger piece but I bought a small one. Half the one Nany Fadhly used. This one costs around RM6. Next, you will need rice. I use SUMO calrose rice. I saw another brand, SAKURA, slightly cheaper but since I've been using SUMO before this, I'll just stick to it. 2 cups of water for 1 cup of rice. 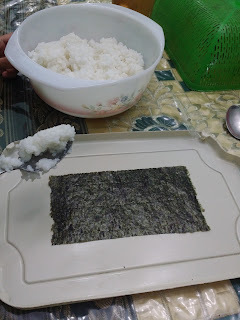 Here I made 2 cups of rice. Cook the rice just like normal in a rice cooker, and then add vinegar when it is cooked and still warm. 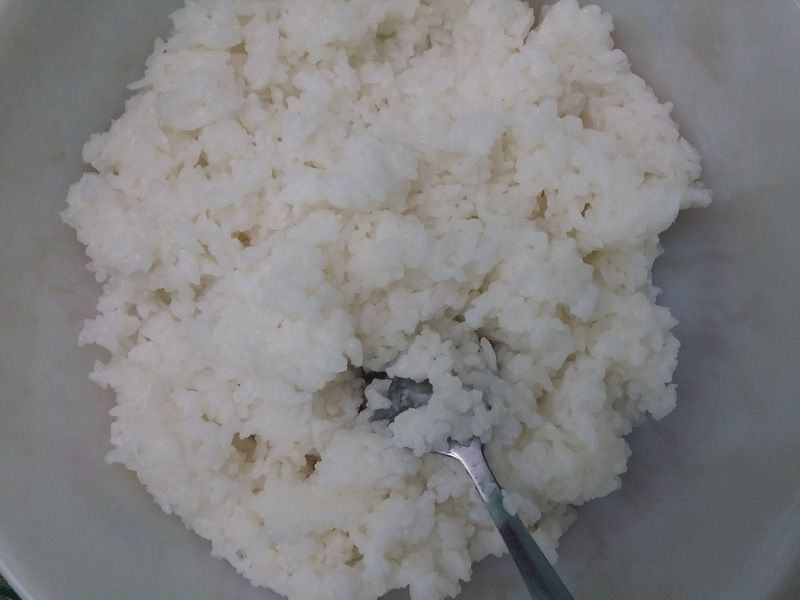 2 tablespoon of vinegar for 1 cup of rice. I used cuka buatan cap Tamin, but my mum said I could also use apple cider vinegar. Nantilah lain kali cuba. Crabstick! This one, I intended to steam like Nany Fadhly... But I got no time for that. Steam have to wash 3 pieces of cookingware (penutup, pengukus, periuk isi air). Boil je sudah, periuk kecik sebiji je cukup. 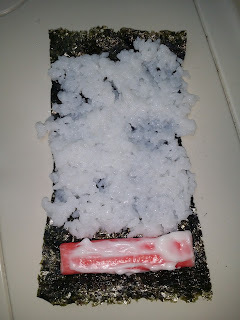 I boil them with the plastic still attached to avoid them from over kembang membayak. Mayonnaise! Haa... Finally, this one I followed Nany Fadhly. Just that I wasn't adventurous enough so I smeared a little bit only. Ended up tak rasa apa pun... Hahahah. Okay... Cukup! Now let's start! Apa? Penggulungnya? Nope. I was too stingy to buy one. Padahal around RM5 je for a set of bamboo roller, wooden senduk, and chopstick. Told you already this is for beginnersssss..... Nak simple kan. 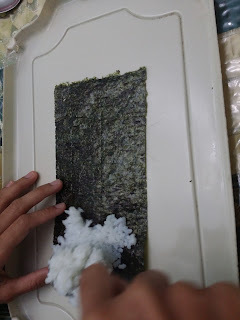 Still not following the tips, I used a SPOON to spread rice on the seaweed. Hahaha. Memang susah. But use TWO SPOONS, and after a few more trials, you'll be an expert already in handling the sticky rice. Or you can just get yourself plastic gloves (like Nany Fadhly). 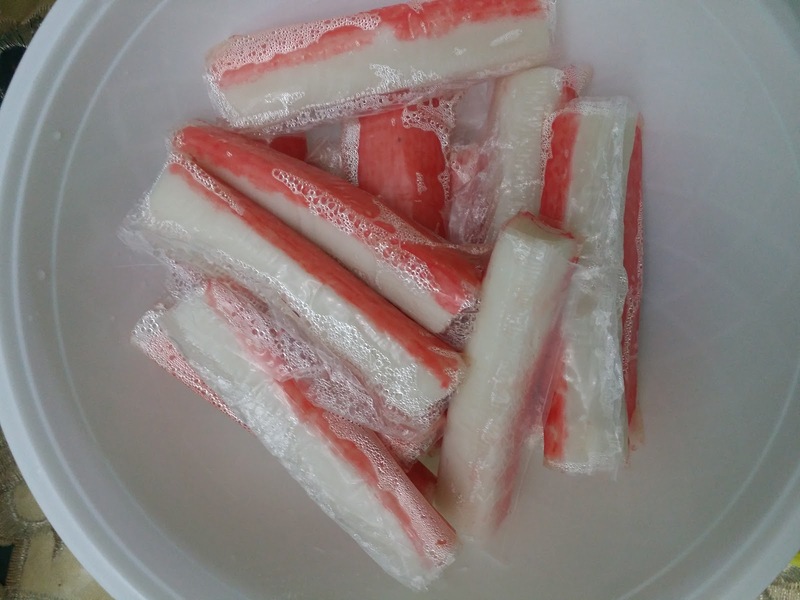 Crabstick and cheese. I don't really like the taste... But my husband said it was good... Hm. 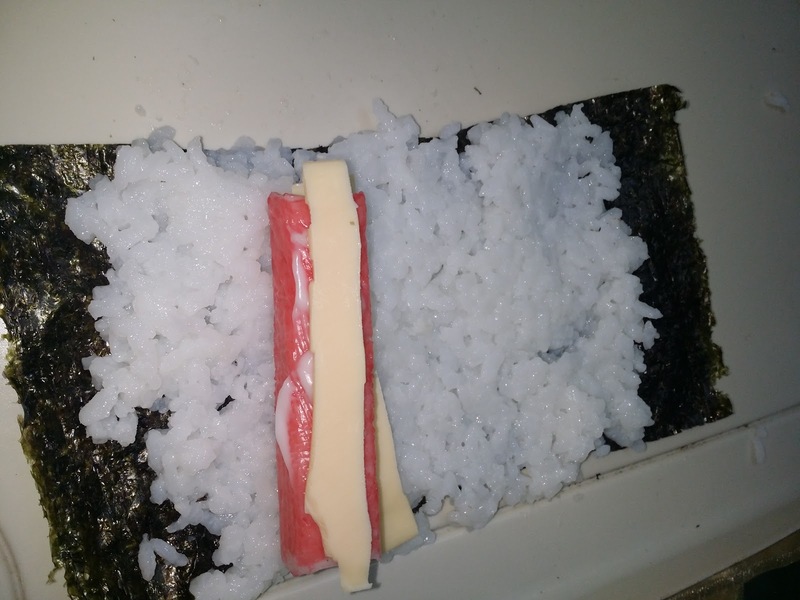 The cheese was just cheddar slices. For 2 cups of rice, you can get I think about 11 or 12 of these mini rolls. Because I still had more rice after using up all 10 pieces of seaweed. 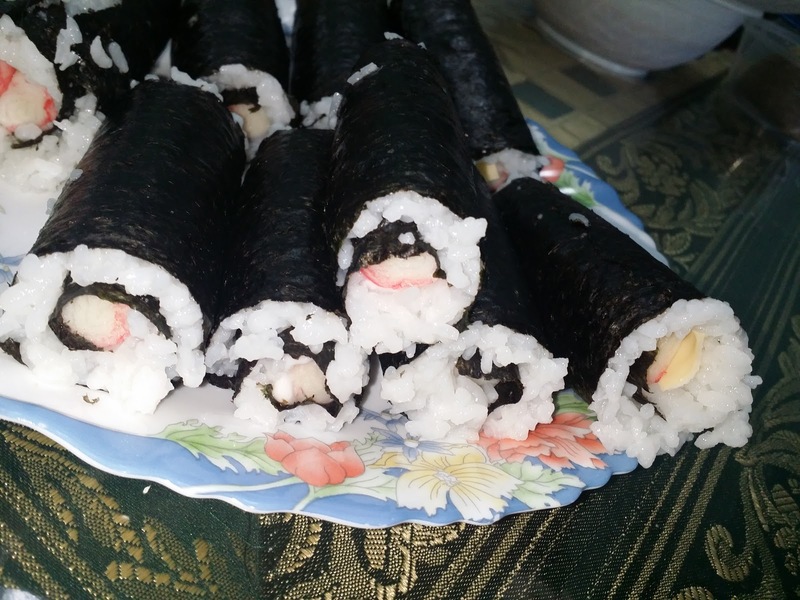 Slice them with a really sharp knife. 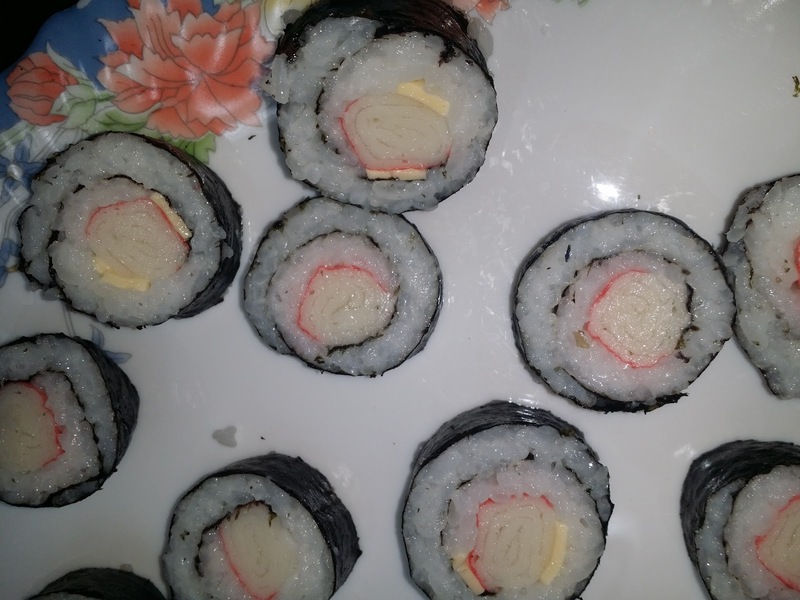 I still had a bit of difficulty in slicing them, though. Note that the knife I use is reallyyyy sharp. How do I slice them? 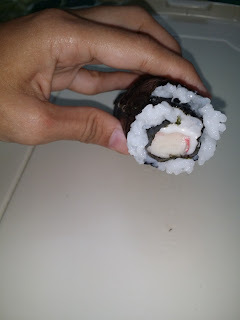 Cucuk the middle with the end of the knife first, then only I slice through it. 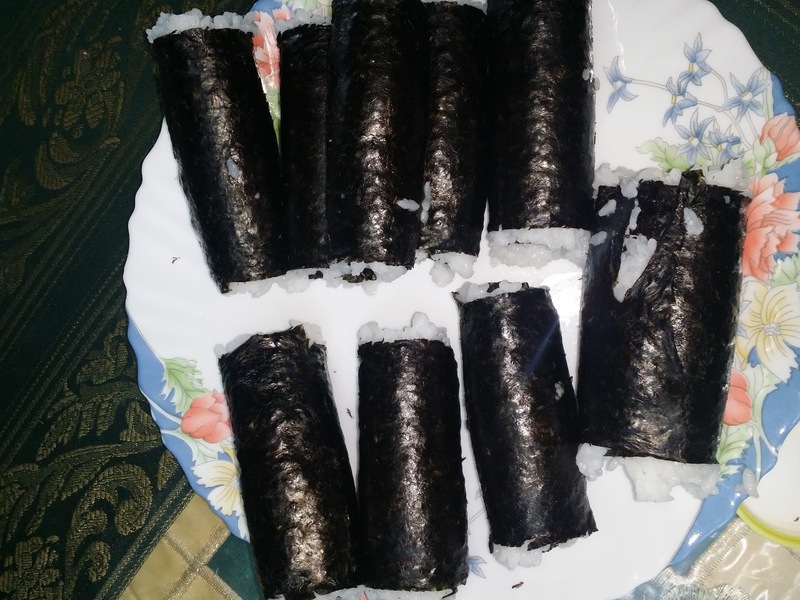 Since I made these on Sunday, I wrapped them up with plastic (like Nany Fadhly) and store them in a refrigerator. Wah ternyata lebih mudah memotongnya! So, here's the end result. Selamat mencuba! Awwww....thanks dear for making my recipe as a reference. You finally did it! 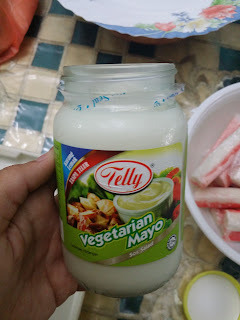 Yang penting tekak kita kata sedap. The look doesn't matter at all. Thanks again! Itadakimasuuu!! !